I make resolution every year to soak dry fruits in advance. But I never manage to. 6 weeks is the best I have done so far. I mentioned in my earlier post how I have been forced to twiddle my thumb virtually! Apart from no connectivity, I also have a lot happening at personal front. I have enrolled to complete M. Tech in Fashion from my alma mater NIFT, Mumbai. I am also getting my kitchen interiors done partially. I am also trying to be socially active in foodie community of Pune. All this needs time and effort. And I am a mother of two. Most of you can understand how stretched I am. Whine… Whine! Coming back to the cake, I made a very good Eggless Christmas Cake soaked, fed and aged in Brandy last year, this year I wanted to try a different recipe and a different liquor. I chose this recipe as it was similar to what I have already done and it seemed simple enough. I made small changes to suit my need. I used a bundt pan instead of a round pan. I baked 2 bundt cakes. One for the family and 2nd for gifting. I also added salt to bring out the sweetness. I sprinkled it with castor sugar upon cooling. I also marinated and fed the cake with Rum for another 2 weeks. Hubby and my family loved the cake. It was a nice feeling. I gifted one cake to #Pune #foodies for #meetup and the compliments and tweets @dipsy, really took the cake. Pun intended! Many of them gathered for the meet and tasted the cake. 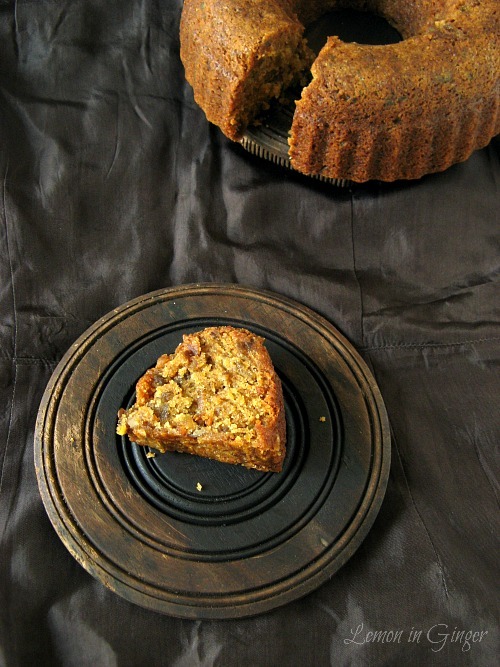 The foodie group is largely carnivorous and I was thrilled to have an eggless cake make such an impression! 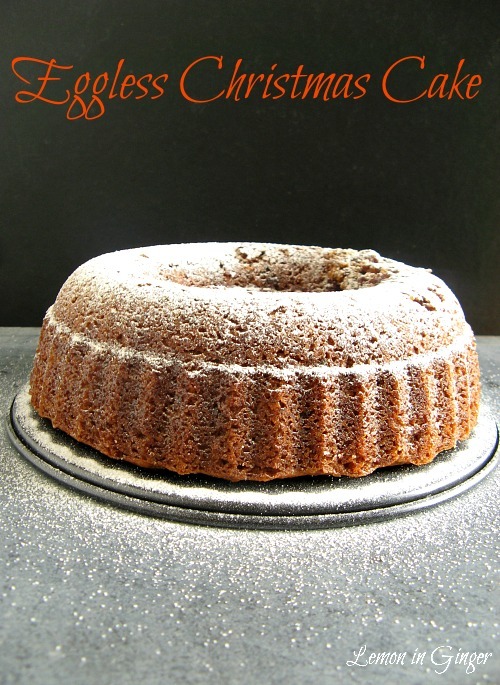 A moist and perfect Chrishtmas Eggless Cake. It is enriched with rum through soaking and feeding. This cake keeps well for several weeks. Prepare a bundt pan and grease it lightly with oil. Sieve the flours, baking powder, salt and all spice powder. Add oil & sugar and mix well. Add the soaked dry fruits and rum. Stir and mix uniformly. In a bowl or mug add apple cider vinegar to milk. Stir gently. Add baking soda and stir. Add this frothing mixture to the cake batter. Add vanilla extract. Stir and mix quickly but uniformly. Pour in the prepared pan. Tap the pan lightly against work counter to remove any air bubbles. Bake in the preheated oven for 1 hour 45 minutes or until a toothpick inserted comes out clean. Remove from oven and allow to cool for 10 mins in the pan. De-mold and cool on a wire rack completely. Marinate a cheesecloth in rum, allow it to soak well. Gently squeeze the cloth to remove excess rum, the cloth should be moist enough. The cheesecloth should be able to go round the cake 2-3 times. Using a skewer or tooth pick, poke holes on the underside of the cake. Brush with rum. Cover the cake completely in cheesecloth going round 2-3 times. Then wrap tightly in aluminum foil and place in an air-tight container. The foil should not come in contact with the cake directly. Do not refrigerate this cake while feeding. 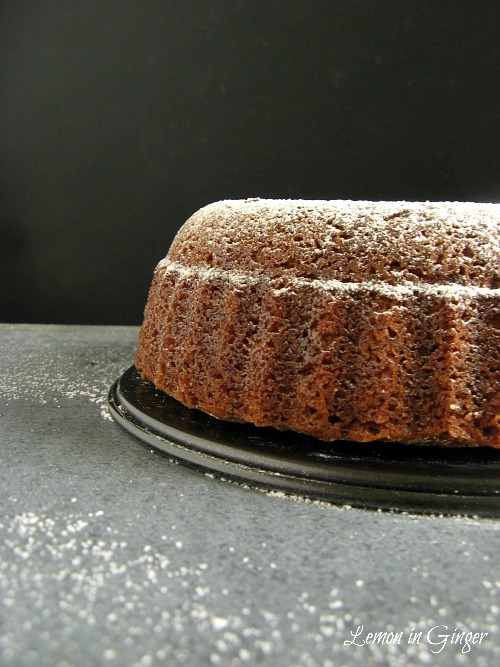 After 4-5 days, remove the foil & lightly brush the cake with more rum through the cheesecloth. Through the old foil & wrap in new foil. Repeat the process till you are ready to eat. This cake keeps well for several weeks. 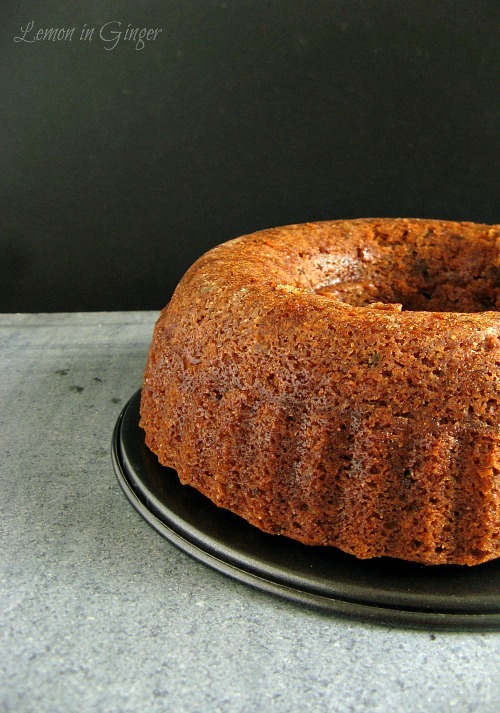 This cake can easily be turned into dairy free cake by replacing milk to soy milk. You can also use 1 Cup melted butter in place of oil, regular vinegar in place of apple cider. You can also make this only APF and substitute the Whole Wheat flour to APF. If the cake browns quickly on top, cover it with aluminum foil/ tent. You can soak overnight in orange or apple juice for non-alcoholic version. In this case, the soak the mixture in juice and place it in refrigerator overnight.